All the crew members who work with us are experienced sound technicians accustomed to working in a live production environment. They know what needs to be plugged in where, what types of connectors are used and how to use them. They know where to put the main speakers, the monitors, the amplifiers and the mixer. If you need technical crew to work on a production, or just to help you wire up your PA system, get in touch with us. When we bring it in from the van, we know what it is and where to put it. We won't ask you whether to put the monitors on stage or in the auditorium. We know and understand wiring protocols for mains (three-phase as well as single-phase), loudspeakers (on older - e.g. EP8 - connectors, as well as current industry-standard four-pole and eight-pole Neutrik ‘Speakon’), and signal cables of all varieties. We can get the PA system running, EQ the front-of-house and monitor systems, line check, fault find, and fix faults. 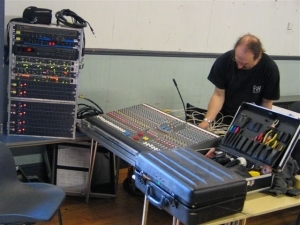 We can do everything that needs doing prior to the sound-check (we can do the Sound-Engineering too, if it helps). We can manage all on-stage requirements, from allocating and controlling sound-check schedules to placing and connecting microphones and other input devices to their correct channels. If something isn't working (or if feedback or other everyday issues need attention), we know how and where to look for the causes, and what can be done to work around the problem if an on-site repair isn't possible or if conventional equipment (e.g. a Graphic Equaliser) is not available. Resourceful - Good diagnostic skills and an adaptable approach help us find quick solutions to unusual problems.